Kohima, Aug 28 : The Naga Hoho has stood firm on its demand for integration of all Naga inhabited areas. "We have told the Centre's interlocutor, RN Ravi, that integration is non-negotiable. We won't just accept social or cultural integration," said Naga Hoho president P Chuba Ozukum.On Wednesday, a Naga Hoho team met RN Ravi, Centre's interlocutor to the Naga peace talks, at a hotel upon the latter's arrival at Kohima on a three-day visit. He was here to hold consultations with Naga NGOs and state legislators. 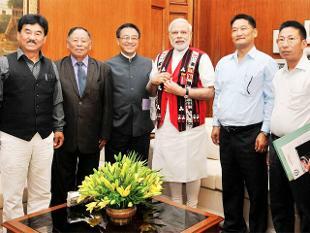 The Naga Hoho president maintained that even the Nagaland assembly had passed the resolution on integration five times.Ravi has assured the Hoho team that Centre will not rest with a 'piecemeal solution' but will work towards bringing in a 'comprehensive solution' to the Indo-Naga political issue.It may be mentioned here that on August 3 a framework agreement was signed between NSCN(IM) and the Centre.Ozukum said Ravi had narrated to the Hoho members the salient features of the framework, which had been kept undisclosed to the public. Ravi also told the team that the Centre would not make the same mistake as it did in the past. The interlocutor is learnt to have told the Naga group that the final agreement will address the interests of all groups concerned. Naga Students' Federation (NSF) president Subenthung Kithan said on Wednesday, meeting with Ravi was encouraging, positive and serious on the Naga issue. He said Ravi had assured the team of working sincerely to usher in solution at the earliest. Meanwhile, Ravi called on Nagaland governor PB Acharya at Raj Bhavan, Kohima, late on Wednesday. A late night release from Raj Bhavan said Acharya had told Ravi that the state had requested the Centre to hold talks with other Naga political groups with whom the Centre had entered into the peace deal. Acharya maintained that it was necessary to incorporate the view of the other groups in the framework agreement. He said talks should be inclusive involving all groups. He had spoken to home minister Rajnath Singh even before the peace pact was signed with the NSCN (IM), he added and expressed satisfaction that both the Union home minister and interlocutor had been meeting all groups, including civil societies, NGOs, mothers' association and activists.